When the history of British comics is periodically recorded, this is one long-running title (launched in November 1951. By way of comparison: ITV didn't start until 1955) that tends to get short-shift. 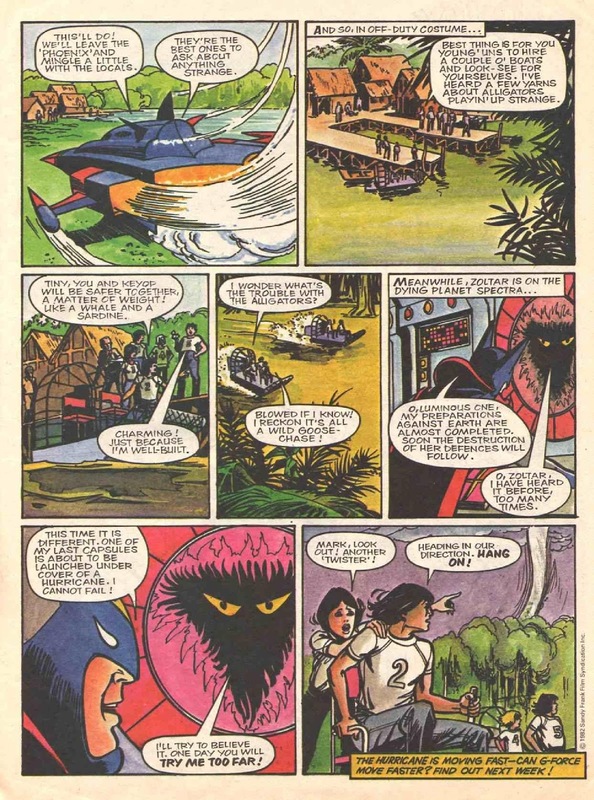 If it's mentioned at all, it tends to drop off the radar in 1979, as soon as it dumped its long-running DOCTOR WHO strip (leaving the way clear for Marvel UK to snap-up the license). TV COMIC actually soldiered on (for an incredible 1,697 issues) until June 1984. It's unlikely anyone mourned its passing. I only very slowly became aware of the fact that I wasn't seeing it on the shelves anymore as I hunted the latest issues from IPC and Marvel UK. Finding copies post-1980 today is nigh on impossible. Presumably because so few were selling at the time and, also presumably, not to the sorts of kids that would savour them for future collectors. 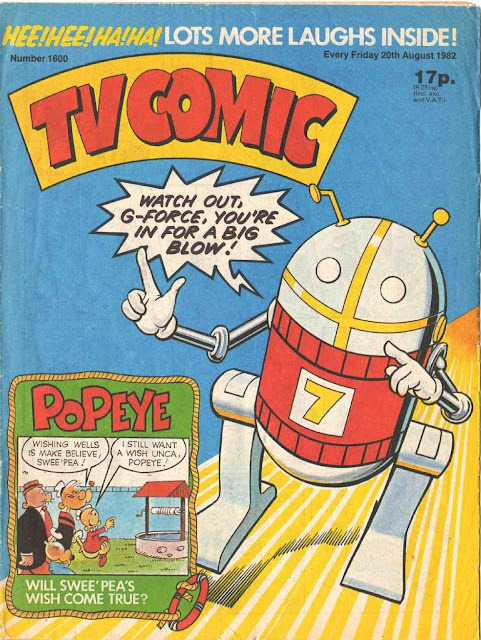 Which is a bit of a shame as it appears to have staged a belated attempt to claw back readers from the likes of LOOK-IN (its closest direct rival) by running several (always uncredited) action/ adventure strips alongside the more humorous fare of Popeye, Tom and Jerry and British Telecom's mascot Buzby. As this August 1982 (number 1600!) shows, they were doing a competent adaptation of BATTLE OF THE PLANETS, a strip that seems to have been entirely overlooked whenever G-Force's comic strip incarnations are discussed. It's hard to judge from one instalment (and the cover in unintentionally, I assume, hilarious) but it seems to be just as good as Western's admitedly-not-very-good US version (reprinted in the UK in the BOTP Special and annual). Publisher Polystyle was also savvy enough to sign deals to adapt TALES OF THE GOLD MONKEY, THE A-TEAM (before the strip shuffled across to LOOK-IN) and - ahem - MISTER MERLIN. 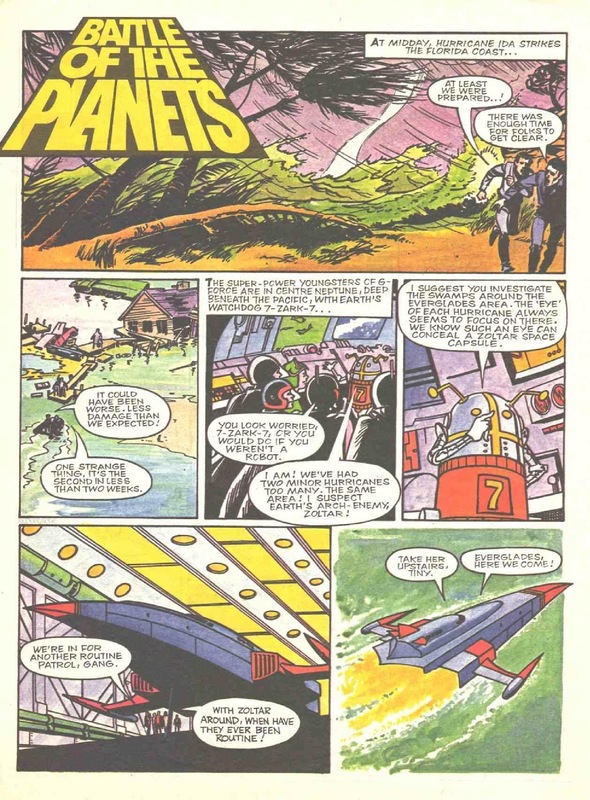 They attempted a comeback in January 1985 with a much more blatant Look-In clone, BEEB, built (as the name suggests) around the BBC's roster of programmes and stars (GRANGE HILL, THE TRIPODS) in strips and articles. It wasn't a success and vanished suddenly after only twenty weeks.